When I wrote about the mobile aware link shortener and micro-blogging network, Delivr‘s new Ping.fm integration a few weeks ago it only worked in desktop browsers. 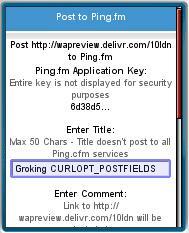 No more, now you can create a Delivr Share URL in your mobile browser and immediately post it on multiple networks using Ping.fm. So what are Delivr and Ping.fm and why would you want to use them? Delivr is a short URL generator that lets you shorten links and share them on nine different social networks, one at a time. It’s a mobile friendly service that automaticlly directs visitors to the mobile or desktop versions of the content you are sharing. There’s much more to Delivr too like analytics, micro-blogging, backup and download of your shared URLs and a QR code generator. 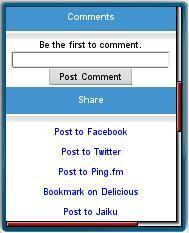 Ping.fm lets your share links and messages on 41 different social networks. That means you can simultaneously update your status or promote your latest blog post on Twitter, Facebook and other networks with a minimum of effort. First you need to have accounts on both Delivr.com and Ping.fm. Both are free. Now when you go to Delivr.com with your mobile browser you can select any of your Delivr shared URLs and click the new Post to Ping.fm link (first image). This brings you to a form (second image) where you can enter a title and descriptive text to go with the link you are sharing. You can also share new URLs by entering them on the Delivr mobile page. into a bookmark. When you want to share the page you are currently viewing with Delivr, just select thae bookmark and you will be taken to the Delivr share page with the URL already created. Opera Mini users can get the bookmarklet without having to type or paste by visiting the Opera mini bookmarkets page at o.yeswap.com and following the instructions. This entry was posted in Social Networking and tagged Delivr, ping.fm, Social Bookmarking by Dennis Bournique. Bookmark the permalink. Great! Since I heard that via the Opera Mini I can use the touch screen of my Sony Ericsson Satio while browsing I’m absolutely into Opera Mini and this App looks like another great program!